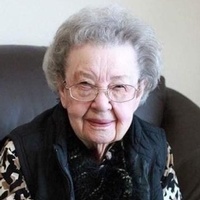 Eunice Munt of Thief River Falls, MN, passed away on Sunday, December 2, 2018 five days short of her 100th birthday at Thief River Care Center, Thief River Falls, MN surrounded by her loving family.Mass of Christian Burial will be held at 1:30 PM on Monday, December 10, 2018 at St. Bernard’s Catholic Church in Thief River Falls, MN with Father Rick Lambert presiding. Burial will follow at St. Bernard’s Cemetery in Thief River Falls. 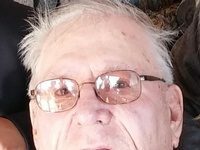 Visitation will be held from 4:00 PM until 7:00 PM with a 6:00 PM prayer service on Sunday, December 9, 2018 at Johnson Funeral Service in Thief River Falls, MN. Visitation will also be held one hour prior to the service on Saturday at St. Bernard’s Catholic Church. On October 15, 1942, Eunice was united in marriage to George Patrick Munt at St. Bernard’s Catholic Church in Thief River Falls. They traveled to the Twin Cities for their honeymoon via the Winnipeger passenger train, and within a week, George left for service in the United States Army. 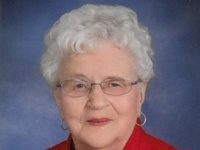 She was a member of St. Bernard’s Catholic Church and Ladies Guild. 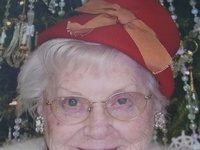 Eunice was also a member of the Soo Line Railroad Ladies Auxiliary and was an election judge for many years. Survivors include children, Pat (Carol) of Park Rapids, MN, Mike (Charmaine) of Park Rapids, MN, Tim (Kaye) of Oklee, MN, Mary (Wally) Walseth of Thief River Falls, Kathy (Scott) Balke of Inver Grove Heights, MN, and Teresa (Rick) Reierson of Thief River Falls; 7 grandchildren, Steve (Val) Solheim, Kim (John) Kiel, Elizabeth (Josh) Knudson, Brian Walseth, Katie Walseth, Maureen (Jess) Bartelt, Alex (fiancé Zach Vraa) Balke; 12 great-grandchildren, Courtney, Carson, Luke, Adrian, Tyler, Cierra, Caroline, Adele, Laia Lou, Jack, Jemma, Lane; 1 great great-grandson, Beau; and many other relatives and friends.